I have never liked Puerh teas because they taste too earthy and like mud in my opinion. 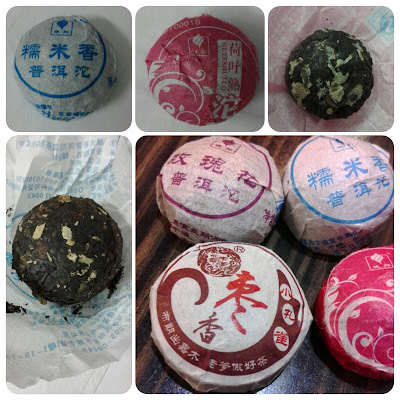 Recently I went past this stall and saw these tea tablets and got some to try because they smelt quite nice especially the glutinous rice one 糯米香普洱 and Lotus Leaf 荷叶普洱沱茶. Puerh and glutinous rice was really fragrant like pandan. The puerh lotus leaf is like drinking tea after just having eaten lotus leaf wrapped rice dimsum. There are other flavours as well such as lemon, rose, dates etc.